Fabulous Floral Waters! Tone & Cleanse Using the Power of Nature - Part 3. - Amphora Aromatics Ltd – Supplier of pure essential oils and aromatherapy Products. Fabulous Floral Waters! Tone & Cleanse Using the Power of Nature - Part 3. Hi all. Sophie here with the final Fabulous Floral Water Blog. In this blog I am going to be talking all about the stunning Floral Waters of Orange Blossom and Geranium. Recovered from the distillation of essential oils or an essential oil dissolved in water, Floral Waters are usually referred to as Hydrosols and Hydrolates. Floral Waters make perfect natural skin toners and refreshing spritz as they hold many of the benefits of the essential oil but are a lot gentler and so can be used directly onto the skin to help hydrate and nourish the skin. Orange Blossom Floral Water is a beautiful citursy-sweet floral scented water that can help to balance, calm and cleanse skin suitable for oily, combination skins. 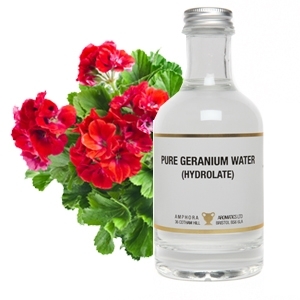 Geranium Floral Water helps to sooth and balance skin so is especially good for combination skins. It has a lovely sweet floral aroma that is refreshing and uplifting. To enhance the benefits of using a floral water on your skin you can add a few drops of Essential Oils to the water. Geranium essential oil has great antiseptic and astringent properties which help normalise sebum production. Cypress essential oils astringent properties help to clear oily congested, oily skin. Lavender essential oil helps clean and care for skin, balances oil production and stimulates the circulation. Neroli essential oil has gentle antiseptic properties that help with treating acne and helps to rejuvenate and regenerate skin. When adding essential oils to your floral water you will only need between 10-15 drops as too much can overwhelm skin and cause more problems. Before each use gently shake the floral water to ensure even mixture of the water and added essential oils. Once you have cleansed your skin simple apply a small amount of the water to a cotton pad and gentle wipe over face and neck. Alternatively sprits over face ensuring eyes are closed, this is perfect for those hot, sticky summers’ days when your skin is in need of little hydration and refreshing. You can also add floral waters to the water when removing your cleanser or your bath water for a skin an extra skin pampering treat. Thank you for reading! click here to check out my other blogs if you are looking for more helpful tips and recipes on natural inexpensive skincare.